The product is terrific! Because the boxes are plastic, they do not tear and are super easy to use. The size is just perfect, too. I am so thankful that I ordered these from Beau-Coup. Great little favors that are different! I was looking for something that would be different for a graduation party favor. These were perfect. I filled with shredded paper(in the school colors), put a wrapped mint in that had 2011 printed on the wrapper and also put one fortune cookie in the box. Then tied ribbon in the school colors on the handle. My son loved them and I'm sure our friends will too! 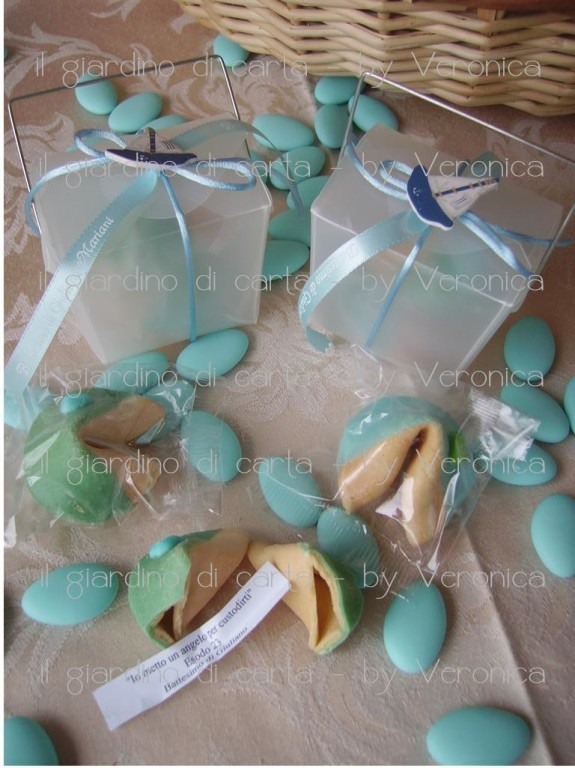 These boxes were the perfect way to present our personalized fortune cookies for our office holiday function. LOVED it! They were cute but really small so don't expect to put a lot into them. They are less than half the size of a normal take-out container. They were so simple to implement! I bought the red boxes. I used pink (paper) napkins, filled with an assortment of candies, and allowed the napkin ends to fan out above the box. I used these, along with the Custom Fortune Cookies, as party favors. They are easy to use and are a good size for fortune cookies or for holding smaller things. I have some extras and I love them! We purchased these boxes as gift containers for some of the larger bracelets we make[@]Turns out they were a hit with our customers! Great, Cheap Party Favor Gift! Cheap way to give party favor gifts. People loved them - both our guests and the staff at the restaurant! Could have been a bit bigger - only able to hold 2 of the fortune cookies. Capacity for 3 cookies would have been a little nicer. I thought these take-out boxes were just the cutest, they worked just wonderfully with the fortune cookies I ordered. Nifty and small, they were eye-catching, yet not over-the-top. I used them for a baptism, so I wanted something fresh and fun...and found these! Q:how much does it hold? A:These boxes hold about 5 ounces of m&m's. 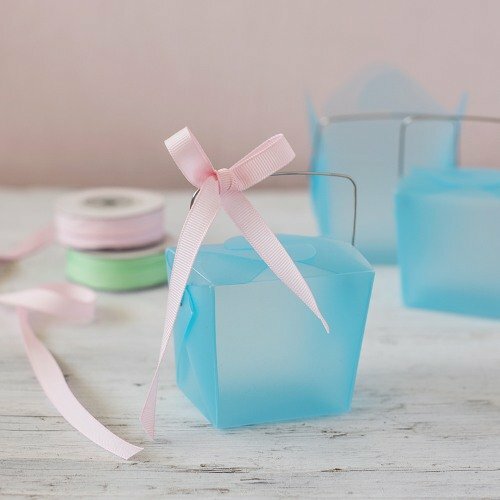 Our vinyl container fashioned after Chinese takeout boxes is a fun and unique way to package your party favors. 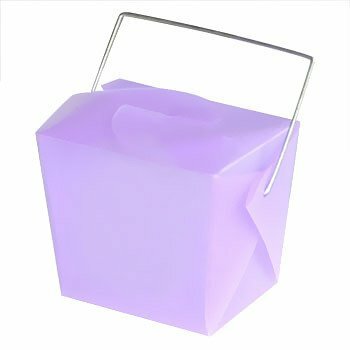 Whether your event is centered around an Asian theme, or you're just looking for an alternative to traditional packaging ideas, the take out box with its sturdy handle and array of colors is the perfect favor container for your guests to take their goodies home. Personalize your box with a designer label printed with a name and the date of the event. 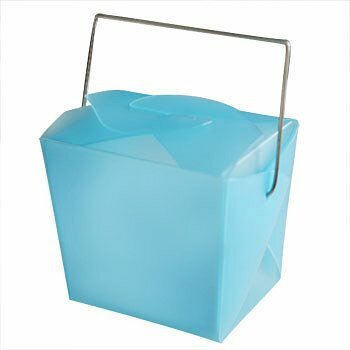 Take out box container measures approximately 2.25"L x 1.75"W (base), 2.75"L x 2"W (top), and 2.5" in height.